In the process he mentioned how watching sea-ice shrink and grow in the Arctic can be a bit like a sporting event, in that Alarmists all cheer wildly when more-than-expected melts, and Skeptics all cheer wildly when less-than-expected melts. I’m not sure I approve, considering billions of dollars are at stake, not to mention the fate of the planet (if you believe Alarmists.) Also the arguing tends to disintegrate into discussions of the mental state and sanity of opponents, which has little to do with sea-ice, to put it mildly. Therefore I’m going to try to steer clear of such debate, when possible, and if I ridicule anyone it will be myself. I will expose myself to ridicule by making a guess at what I think will happen. Then I will be wrong. Then I can have all the fun of ridiculing someone, by ridiculing myself. What is more difficult to forecast is whether the red line in the graph below will be above or below the green line. For some reason this is the third straight year that temperatures dipped below normal in May. It remains to be seen if they stay below normal for the rest of the summer, as they did the past two summers. I forecast that they will. One way to get an idea how thick the ice is, which gives you a hint about how enduring it might be, is to study the NRL ice-thickness map. If you watch this over a period of time some events become obvious. For example, all winter the ice was pushed from the northwest to the southeast across Hudson Bay, and by April the ice was piled up and thick to the southeast, and newly-formed and thin to the northwest. Therefore it is obvious ice will melt away first in the northwest. I forecast there will be some ice still left in the southeast of Hudson Bay in August. In the like manner, a lot of ice was pushed out of the Kara Sea, so I expect it will melt more swiftly in the Kare Sea this year. 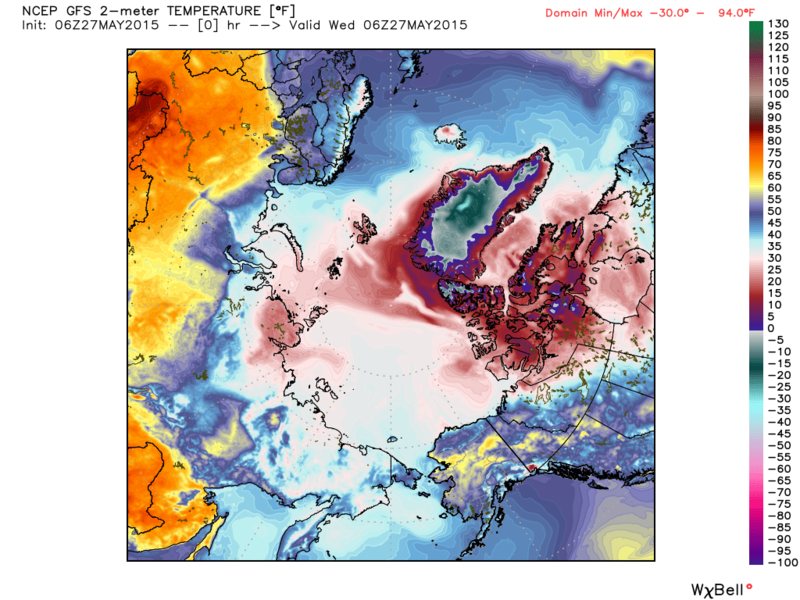 The Laptev Sea, on the other hand, did not export as much ice as last year. Last year the cross-polar-flow was so extreme that ice was pushed far from shore, leaving so much newly-formed, thin ice that, once melting began, an area of open water I dubbed “The Laptev Notch” formed during the summer, and stabbed north of 80 degrees latitude for a time. I forcast that notch to be far smaller this summer, and to have trouble melting north of 80 degrees. What impresses me most in that animation is the bite the Pacific takes out ice north of the Bering Strait. 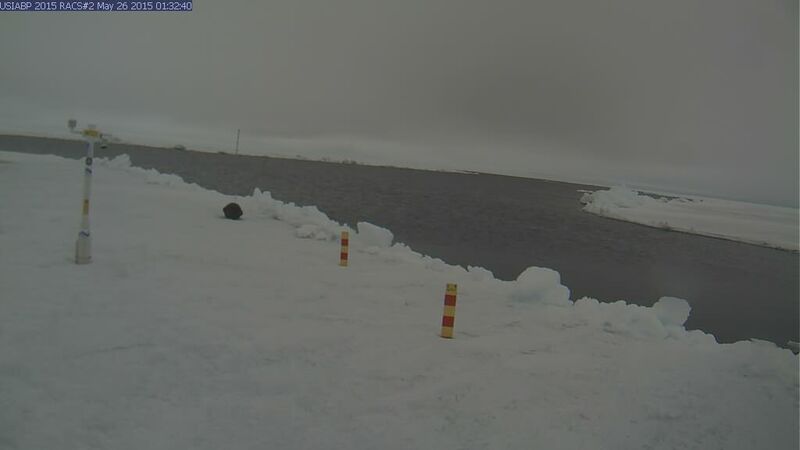 That ice is solid and thick, at the start, but the influx of milder, Pacific water at the surface melts the ice from underneath, and ice that is ten feet thick in April can be gone by September. I am expecting quite a bite to be taken from that ice this year, because the PDO (Pacific Decadal Oscillation) is going through a “warm spike”, and the water coming in through the Bering Strait ought be especially warm. However already I’ve blown my forecast in some ways. For one thing, to the south of Bering Strait the water on the Siberian side has become much colder than normal, and that makes me nervous. 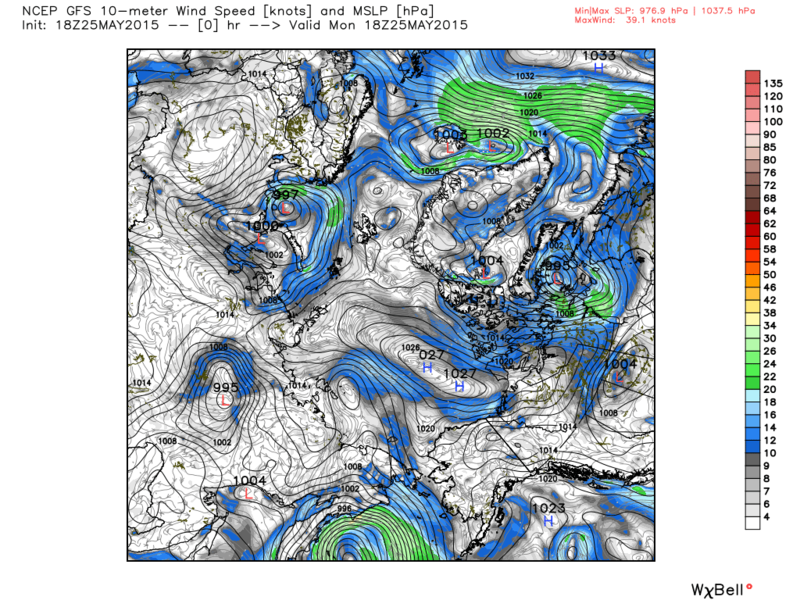 If it becomes involved, the water coming in through Bering Strait won’t be so mild. Also the nice, mild breezes that have been rushing up from the south, and affirming my forecast, are putting me through the old switcheroo. They are swinging to the east and becoming colder. 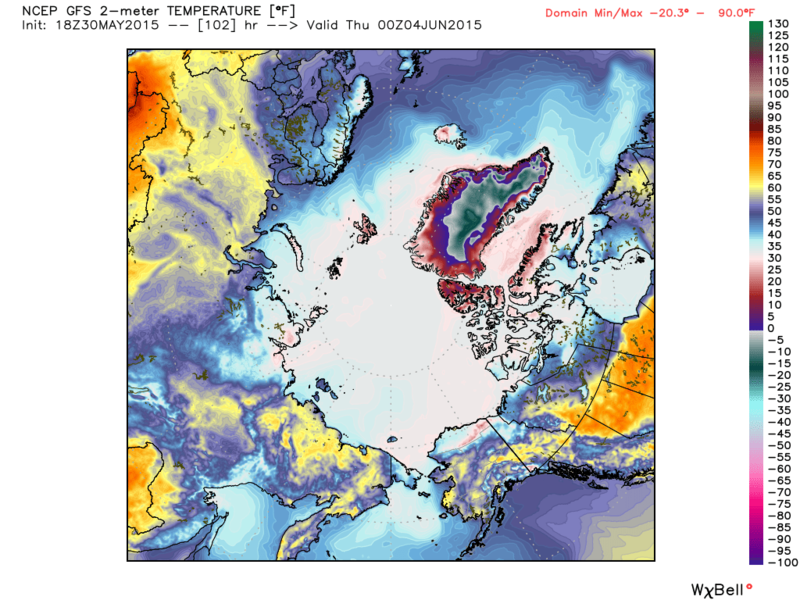 The coldest air is currently parked over the Pole, and along the north coast of Greenland. In three days the cold air will be pulled off the Pole, and it seems the yearly warm-up will be well underway. 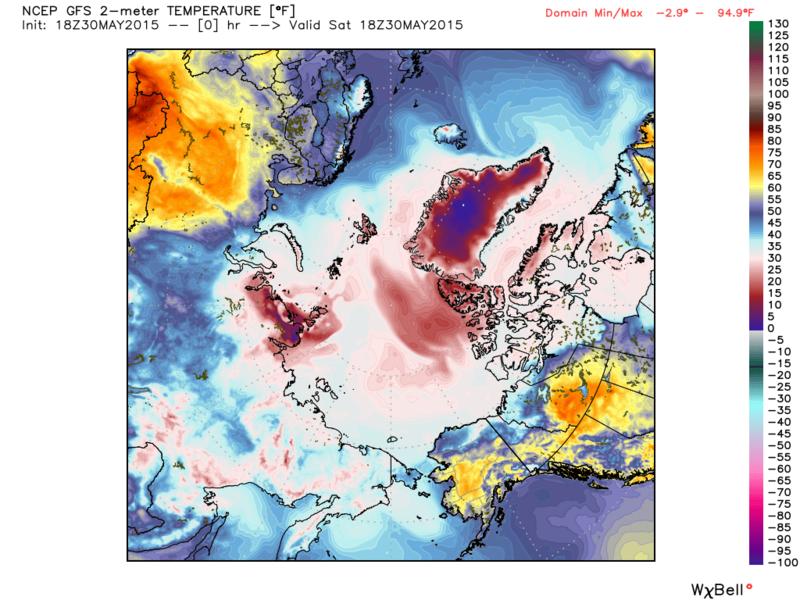 Now the situation north of Bering Strait and in the Beaufort Sea suddenly looks much colder. This does not bode well, in the short term, for my forecast of melting in that area. The GFS model makes it look like the high pressure will remain parked roughly where it is, and an easterly flow will move a lot of the cold air north of Greenland to the west, along the Canadian coast and finally to the Alaskan coast. 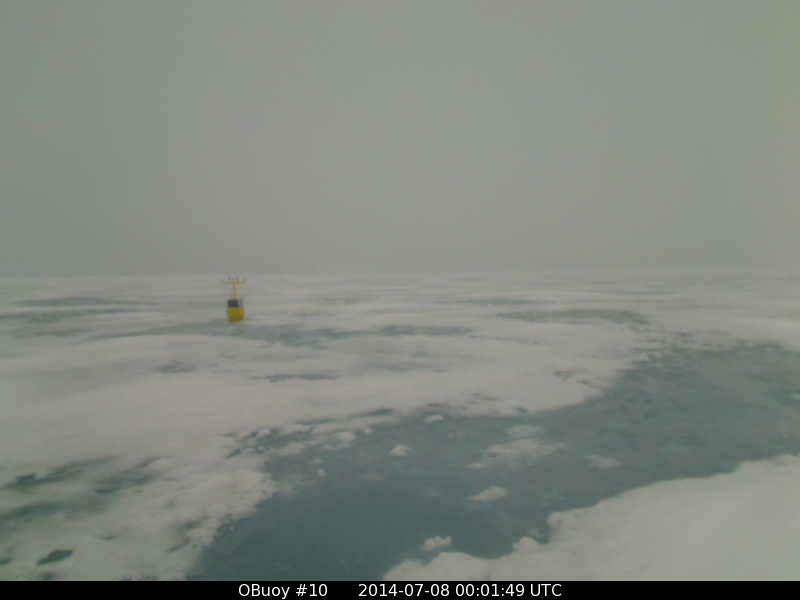 Yesterday I noticed Buoy 2015B: had dropped from above freezing to -3.19° C, and while it has rebounded to -1.33° in the “noontime” heating, the water its camera shows in a nearby lead looks suspiciously like it is skimming over with ice. O-buoy #12 (which is due north of Bering Strait and most likely to first feel the effects of the “warm” PDO), has fallen from above freezing to -5°. The buoy I’ll be watching is Buoy Buoy 2015A: , which is right on the coast of Alaska and effected by the sun-baked tundra just to its south. It’s camera is currently showing a lot of melt-water pools and temperatures are at +0.66°. If the camera starts to show the melt-water pools freezing over, then we’ll know the cold air has really backed west. Of course, the cold will have to come from somewhere, and if the Pole is robbed of all its sub-freezing air, temperatures will likely rise up that way. They may even get their first thaw of the year. 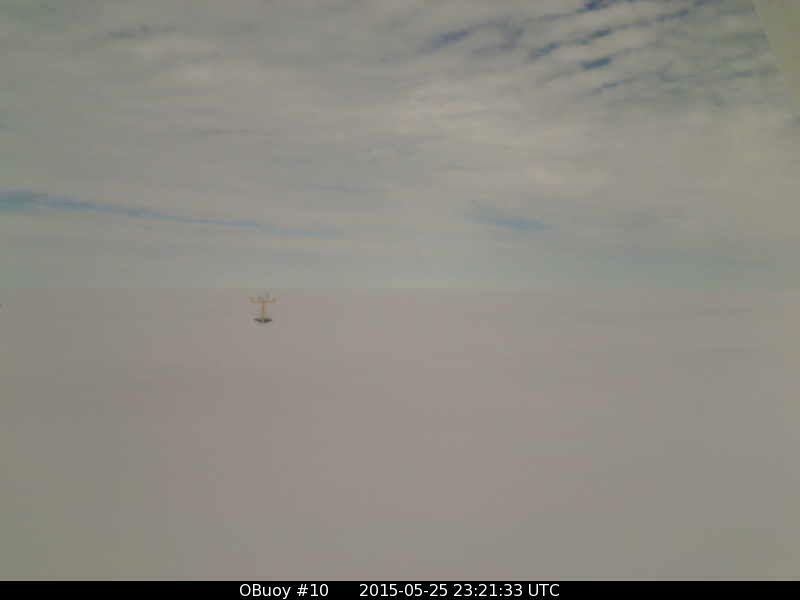 As it is, it is currently -8.42° C up at Buoy 2015D: , which is hard to see but is to the left of this picture, taken by North Pole Camera 1. In conclusion, what is really fun about watching ice melt is seeing surprises occur, and what you don’t expect. I did not expect this cold shot into the Beaufort Sea. What happened last summer, and I expect to happen again this summer, is for there to be some of these cold spells that come right out of the blue, with their origins more or less a mystery. After all, you reach a point where there is no more cold air left at the Pole. In the current situation the Beaufort cold can be explained-away as a case of Robbing-Peter-to-pay-Paul, but later in the summer Peter is broke, so you can’t rob him. It is when there are suddenly temperatures below freezing in July, without any apparent “source reason,” that your sense of wonder starts to come into play. I’m looking forward to that. I seldom root against my favorite weathermen. Their job is rough enough as it is, and has enough humbling involved for ten men. Weathermen also have to deal with a fair number of twerps who remind me of myself when I was thirteen, though they are old enough to know better. These twerps like to portray themselves as being able to out-forecast the weathermen, and then to have what is tantamount to a ticker-tape parade for themselves, as they sneer at the weathermen for being wrong. Of course, if the twerp was honest he would see he is very seldom as adept as the weatherman, however he is very quiet about all the times he is wrong, and sweeps scores of botched forecasts under the rug, and conveniently forgets them. It is only on those rare occasions when the twerp is right that he becomes insufferably vain, and insufferably condescending towards weathermen. I suppose we all were a bit like that when we were thirteen. It is the beginnings of the competitive instinct which can take a complete twerp and turn him into a splendid forecaster, if he is lucky enough to be guided by wise mentors. And I also suppose that is why splendid weathermen do not shoot the twerps who assail them. They see a bit of themselves in the obnoxious little egotists. If course, you do not want to look in the mirror at age sixty-two, as I am, and see an obnoxious little egotist. Unfortunately, (speaking for all when I probably should speak only for myself), there seems to be a bit of the obnoxious little twerp in every man. It is a part of us that refuses to die, no matter how hard we strive to be perfect. Only God is perfect, and the sooner we recognize this fact the sooner we develop the ability to accept our own humanity, and the humanity of others, which seems essential, if joy is to enter our lives. The alternative is to be pissed off all the time about failures. In any case, one reason I like following the world of weather and weather forecasts is because there are few things quite so humbling as trying to forecast the chaos we call our weather. The only other occupation which attempts such difficult forecasting of chaotic systems is psychiatry, but psychiatrists can blame their patients when they are wrong. It is very hard for meteorologists to blame the sky. I don’t see what is so good about 31-days. After all, February has 28 days. Or why does the period have to begin on May first? Why couldn’t it begin on April 27? But no one asked me, when they wrote the rules, and so it is a couple of lousy showers at the very end of May will keep this May out of the record books. It will not be remembered. Only guys like me, who were out there in the weather, will know how amazing it was. 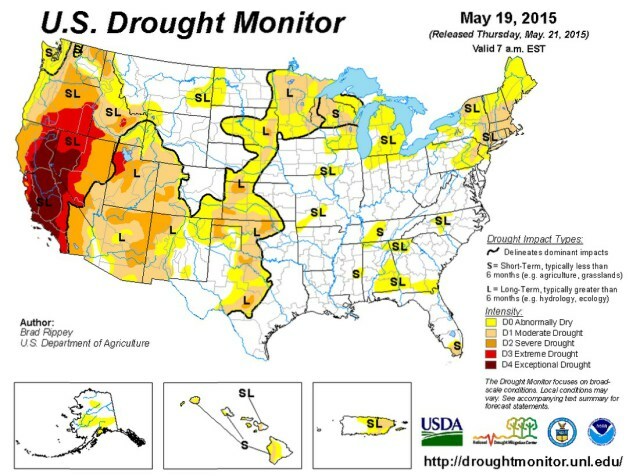 Not that the land isn’t crying out for rain. I just feel that, having had to deal with the nuisance of dryness for so long, putting up with a couple more days of it would be worth it, for then we’d get some credit. As it is, no one will remember we tough outdoors-men, who weathered the weather. I was fairly certain this front would drench us, because my wife had scheduled an event at our Childcare involving lots of parents, and held outside. It has been my experience that, if she scheduled such an event in the Sahara Desert, the desert would bloom. I myself tend to grumble when my wife holds these events, for three main reasons. First, she expects me to make the farm look more groomed than any hardscrabble farm has any right to look. Even when I explain daisies and buttercups make a beautiful playground, she wants it mowed like a golf course. That means I have to mow in clouds of dust and 90 degree heat, so of course I grumble a bit. Second, I can’t help but cringe at the expenses, especially as they are business expenses. I have my doubts that the IRS will approve of strawberries and whipped cream as a business expense, but my wife wants the parents treated like royalty. So I grumble about that as well. I was slightly annoyed she was holding the event a little early this year, as it promised to ruin our chances for the driest May ever, with the typical deluge. You could see the big storms developing out in upper New York State, and moving towards us, but it seemed my wife got the timing wrong, as her event was scheduled for six o’clock and the storms weren’t expected to hit until seven-thirty, when the event would be ending. Looking at the above radar map. you can see the big storms entering western Massachusetts and crossing from Vermont to New Hampshire, but you can also see the storms have a sort of waistline, right on the Massachusetts border. This often happens. Storms, when they come from the west, pass north of us and south of us. Also the storms died down swiftly as the heat of the day faded. Looking at the above radar shot you’d doubt the line of showers could pass and give us only 0.07 inches of rain, but that is what happened. We had traditions to keep, and they were kept. At the end of our event the small children took their parents out to see various parts of the woods behind the Farm-childcare. Small children like being able to be guides, and show their parents places with names like, “The Cliffs”, “Lightning Rock”, “Reptilian Grove”, and “Checkerberry Woods”. They all vanished into the trees in a leisurely, ambling manner. Then there was a single, loud boom of thunder. It was wonderful how swiftly everyone reappeared. But amazingly that single boom was the only boom we got. It didn’t take long for the sun to dry everything, the next morning. After all, in late May the sun is as high as it is in hot July. Yesterday morning was what may turn out to be the peak of our dry spell. Lawns were starting to have brown patches, as if it was August. Even the trees, with deep roots that go down to where the water-table remembers February’s deep snows, were showing a slow-down I never recall seeing before. For example, now is when the leader shoots of pines, (and every other plant as well), grows with their most frantic speed, to climb above the competition, but the leader shoots seemed short. Without brains, the vegetables were reassessing their profits and liabilities. Once again, in the afternoon, a line of thunderstorms developed, but this time it was not so fat and impressive. If you look at the above radar shot, understanding red represents heavy rains, you will notice it is red in Maine, and red in Massachusetts, but only green in New Hampshire. Yes, it happened again. 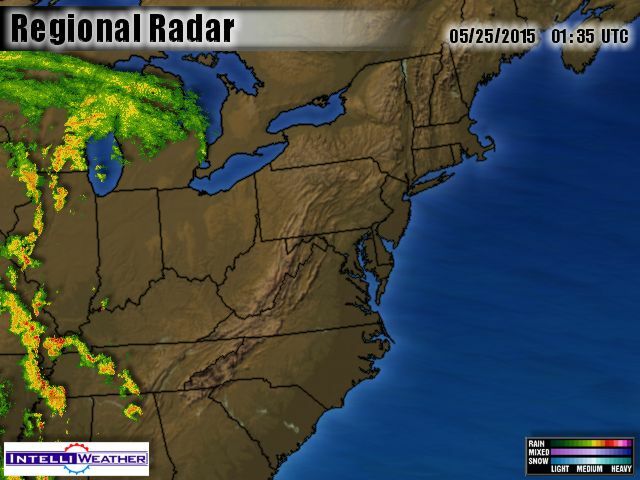 Big storms passed to our north, and to our south. However this time we got the skirts of both storms, complete with wonderfully cooling downbursts and tumbling lines of purple clouds, so this time we got 0.35 inches of rain. 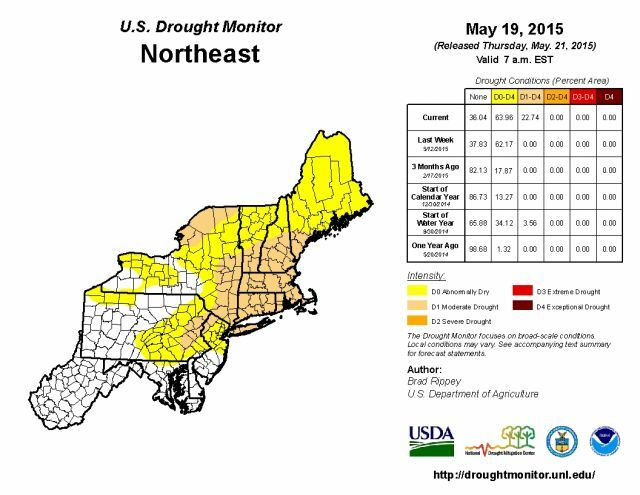 And today it is bone dry again, with the closest rain well to our west. 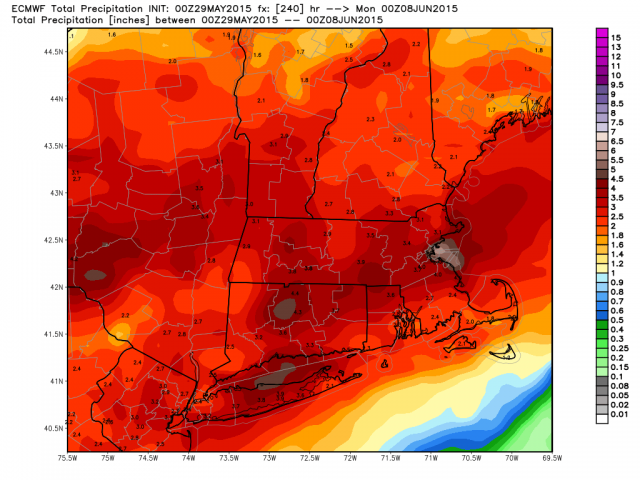 To Boston being hit by five inches of rain, from next Sunday to next Wednesday. 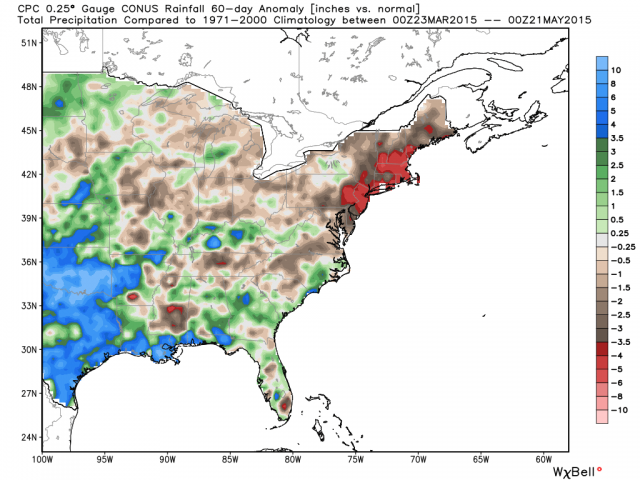 Boston is five inches below normal, so five inches would be a real drought-buster for them. 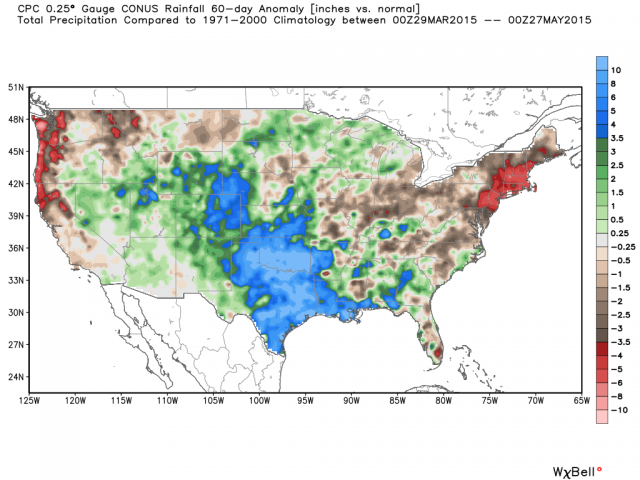 But if you look at that same map, you will notice a bulge of lighter red, indicating around two inches of rain, poking down from New Hampshire to central Massachusetts. And yes, that is us again. We do seem to miss out on the deluges, this year. The arctic continues to warm rapidly, as is usual this time of year, but it remains below normal. Currently low pressure rides along the Russian coast, and high pressure along the Canadian coast. The snow cover is mostly gone in Alaska, but remains in Siberia. O-buoy 9 is in the colder air just north of Greenland, while the other three o-buoys are in the Beaufort Sea, which has seen some cooling after a recent thaw. O-buoy 9 continues to show the lead in the near distance close. It was quite wide and open, but now is crunched together and frozen over. Temperatures are slowly rising, as is expected in May. If you have two minutes to spare, I recommend watching the O-bouy 9 movie at http://obuoy.datatransport.org/monitor#buoy9/movie from the 24:00 time onward to the end at 25:45. It takes the O-buoy people a while to update the movies, but they just updated O-buoy 9’s up to May 23. After 24:00 there are some very cool views of the mountains of Greenland way off in the distance, when the weather is clearest. Then the lead forms at 25:12, during a very windy and stormy time, and gets wide and freezes over before again closing. The thin ice over the leads is ice that would not form if the water was not exposed, and also represents heat lost to the atmosphere up there, which makes it all the more surprising that temperatures are below normal. Then, when the lead closes, all that thin ice gets crushed together and adds to the volume of the arctic ice. The only time this process doesn’t occur is during the period of roughly 60 days when temperatures are above freezing. 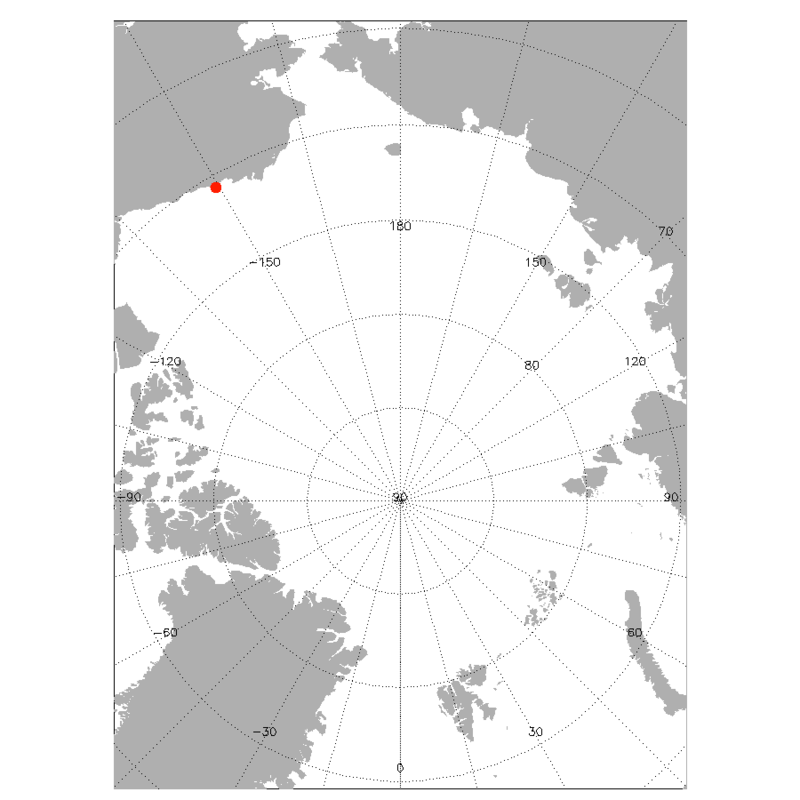 O-buoy 10 has been wandering in circles out in the Beaufort Sea since it was placed out there in late August 2013, and is an old friend. Currently its view is a bit boring, as all the details of the ice are hidden under snow. It saw some thawing last week, a cold snap (down below -7° c) over the weekend, and currently is just below freezing. 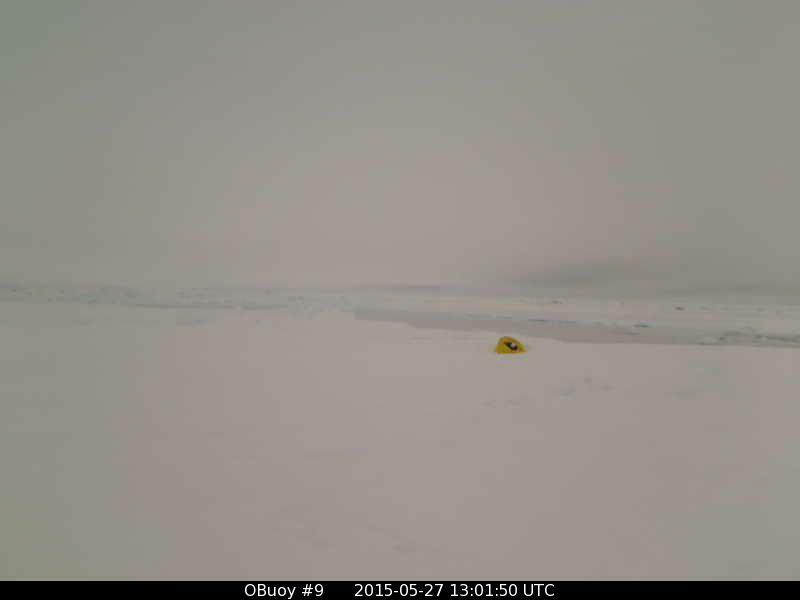 O-buoy 10 is apparently on a particularly solid chunk of ice, and gives the somewhat false impression the ice is more stable than it actually is. The ice in the Beaufort Sea is best thought of as fragmented. 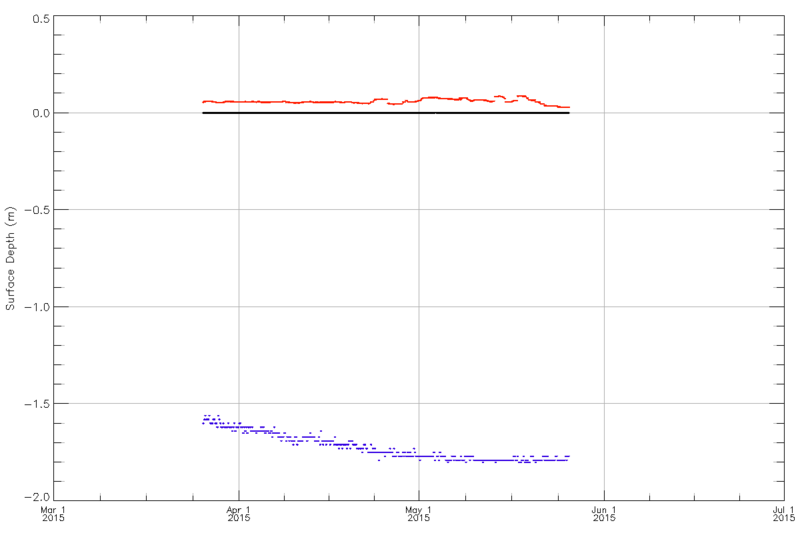 This is shown by the fact O-buoy 11 was placed north of where O-bouy 10 now floats last October, but now O-buoy 11 is well to the south east of O-buoy 10. The ice floes and bergs often move in a manner which demonstrates they are independent. Small floes with pressure ridges are like a boat with sails set, and can move much faster than a large, flat berg. 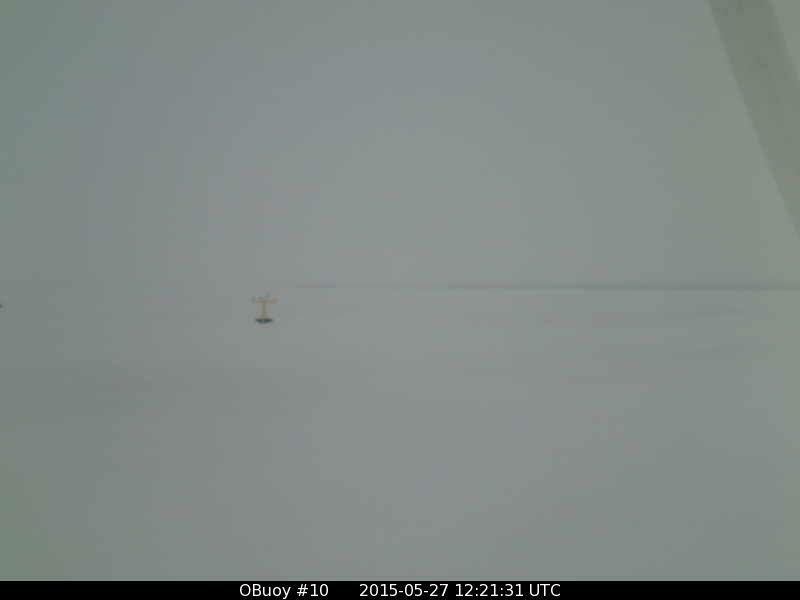 O-buoy 11 has been frustrating, as an interesting lead formed in the middle distance, but the lens has been covered with snow a lot, and it was hard to witness what followed. The lead apparently slammed shut, and became a pressure ridge which blocks the view beyond, to a certain degree, and makes it hard to see what the lead is up to. It looks like the lead may again be opening up a little. It too experienced the recent thaw, but now is back down around -4° C.
Lastly, O-buoy 12 is located further to the west, and, because it is north of Bering Strait, it is liable to be the first buoy subject to the warm PDO’s milder waters invading through the Strait. 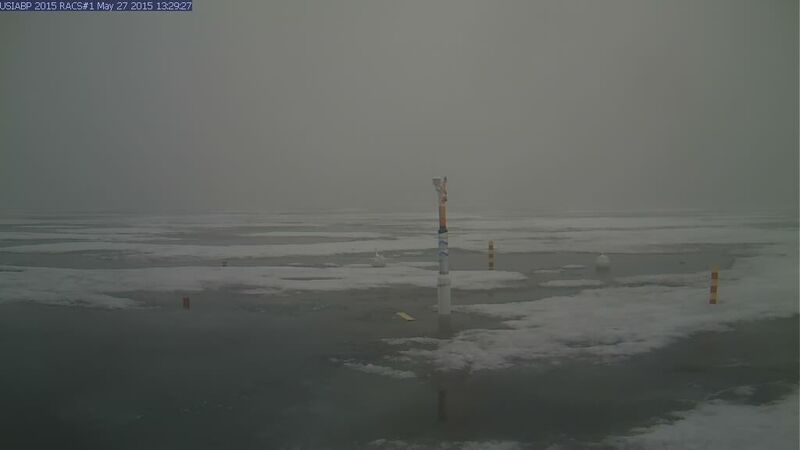 I am expecting to see a lot of action from this buoy, in terms of ice crumbling, leads forming, and the sort of general break-up of ice that Alarmists love to see for political reasons, and I like to see because it is more interesting than watching ice just sit there and stay flat. 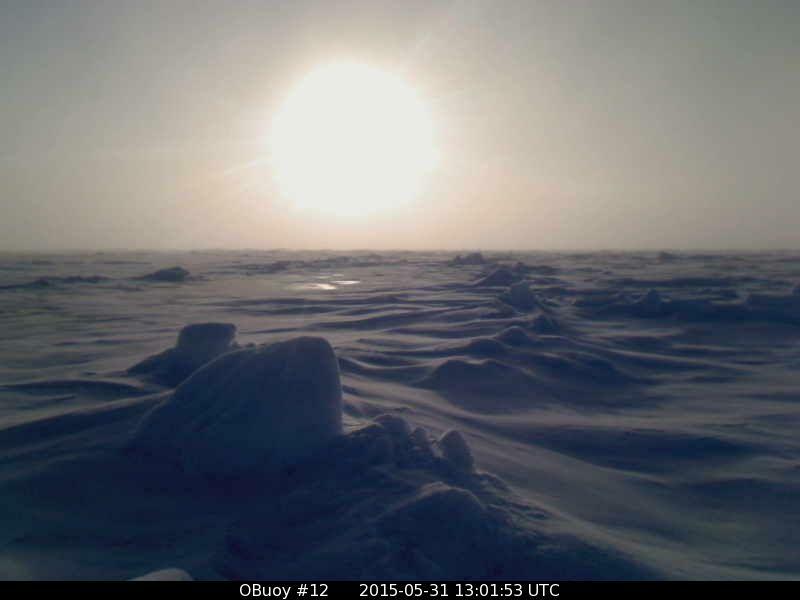 Nothing much is happening at the moment, but I include a picture from O-buoy 12 because it is just, plain beautiful. (That is actually a reason to sit around watching ice melt. Watching icw also is cooling to me, and it is 90° here in New Hampshire, today.) At the buoy it is hair below freezing, after being a hair above earlier. They had less of a freeze over the weekend, this far west. And that’s the news from O-buoy land, for now. If you refer back to the start of this post it can be seen that the coast has no snow-cover. Temperatures can be considerably warmer over the tundra once it is bare, under sunshine that lasts 24 hours a day, north the Arctic Circle, and nearly as long south of it. Incredible clouds of mosquitoes breed in pools of warm water, with permafrost not many feet beneath, and temperatures even in Siberia rise above 70° and have been known to approach 100°. Tundra experiences extremes Antarctica doesn’t dream of, and the warmth of summer tundra explains the melting of inshore waters. 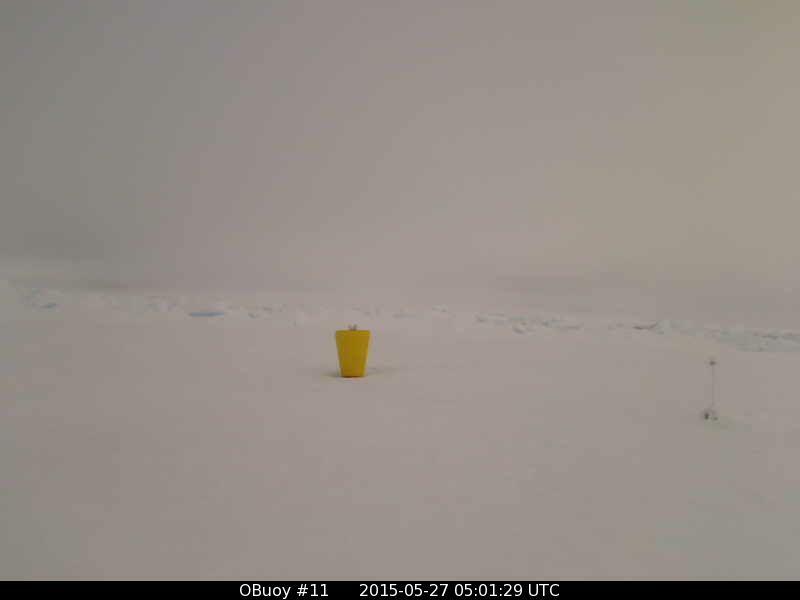 Buoy 2015A: will allow us to watch it as it occurs. And here is a picture as we enter the fifty longest days of the year. It will be interesting to see if this inshore ice can survive even to July. 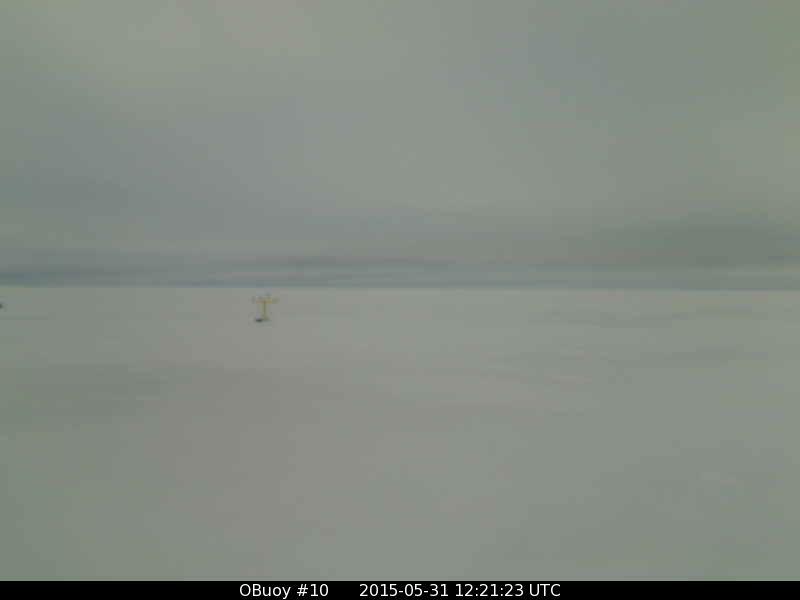 I hope Buoy 2015’s camera can float. An odd thing about Chaos is that it is always trying to become organized. It has been doing this since the Big Bang, which involved a flash of sub-sub-atomic partials of mind exploding out of an Om Point the size of your navel, expanding at warp speed and, within a day, already starting to organize to sub-atomic partials of energy, if not atomic partials of matter. You can see Chaos organizing itself right from the start. Chaos continues in the whirling winds of our weather, yet out of the chaos comes the amazing spiral structures of hurricanes, which fill me with hope, for if nature can organize chaos into such structure I may be able to organize the papers on my desk. The problem then becomes: Hurricanes fall apart and disorder returns. (That also happens to my desk.) Chaos goes back to being chaotic, and basically unpredictable. What the better meteorologists of the old school did, (and a few still do), was to seek for signs of order appearing from the chaos. Only when you see order developing can you get an idea what might follow. It is for this reason they leap to attention when anything in the swirling worlds of weather repeats. Not that anything every repeats exactly, but similarities can be seen, and cycles and patterns described. One thing that has repeated is a “warm” spike in the PDO after it shifted to its “cold” cycle. I believe it was Joseph D’Aleo that pointed out this happened in the late 1950’s, and is happening again now. 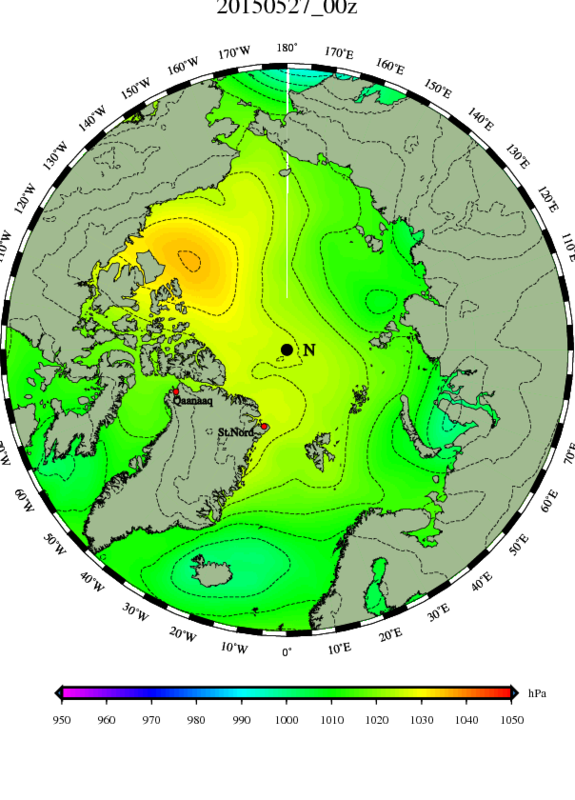 Another order that appeared out of Chaos involved the amount of ice in the Bering Strait, as the PDO shifted to “cold” and then spiked back to “warm”. It seemed quite obvious the ice grew dramatically when the PDO was “cold” and then shrank back when the PDO spiked “warm”. This sort of obvious connection between sea-ice and the PDO cycle is very annoying to certain Alarmists, who insist the ice is shrinking because of CO2 and warming, even though the warming has stopped for 18 years. To me, if the ice does its thing even as world temperatures remain basically flat and CO2 rises, then what causes the ice to do its thing must be something other than CO2 or World Temperatures. However it apparently isn’t politically correct to say so. 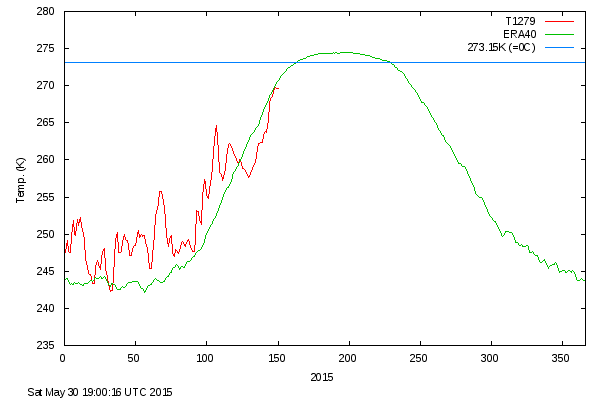 This “warm” spike of the PDO at the start of its “cold” cycle is larger than the last one. I suppose some Alarmists might hope it will stay stuck in its “warm” state, and disprove the idea that the PDO follows a certain cycle. That hope is likely to get punctured, for already there are signs that the pattern is setting up a rebound to cold. Often such patterns are authors of their own demise, in this manner. However even as it fades, this “warm” spike is likely to last into the winter, and give the Eastern USA a third cold winter, (because the warmth off Alaska builds a ridge which pours airs south on its east side). 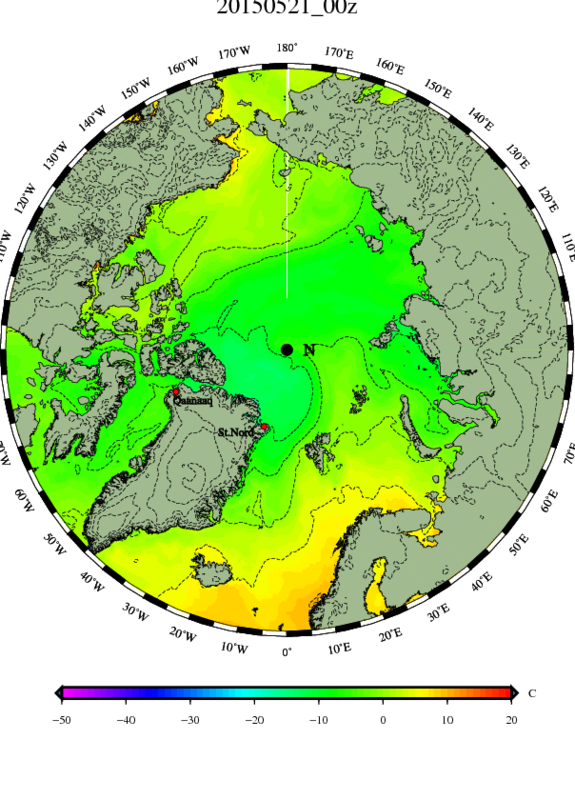 The “warm” spike is also already reducing the amount of ice in the Bering Strait, and likely will soon start to take a bite out of the ice in the Arctic Ocean, especially in the Chukchi and Beaufort Seas. Therefore it is best to be aware of the Pacific-side meltdown, and not involve yourself in knee-jerk arguments with Alarmists. You will look foolish if you automatically argue that the melt isn’t happening, when it likely will be happening. Some of melt-down will be normal stuff that happens every year, and some will be normal stuff that happens when the PDO is warm. What usually happens up there is that the ice melts along the shores. The land heats swiftly once the snow is gone, and the tundra can often experience temperatures above 70° (21° Celsius.) This warmth melts ice along the shore even when the colder ocean pushes a cold sea breeze inland, and any time the wind shifts around to the south and becomes off shore, mild winds push out over the ice, and the ice itself is also pushed away from shore. For example, right now a Aleutian Low off the east coast of Russia is pushing air up into Bering Strait and on towards the Pole. (The above map is produced by Dr. Ryan Maue at the Weatherbell Site.) The Aleutian Low straddles the bottom center margin, and the Bering Strait is at the bottom center. 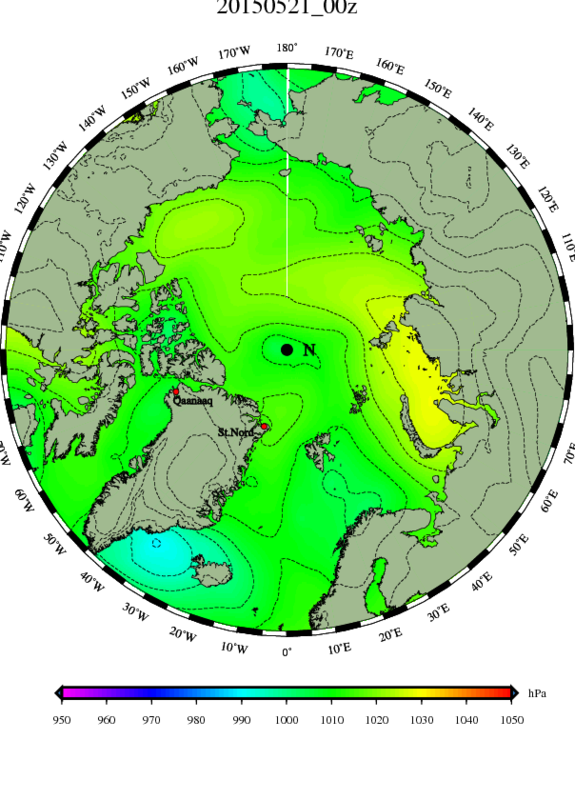 It is the winds that do most, when it comes to creating open water, though an influx of milder water through Bering Stait also does a lot, when it comes to melting the ice from the bottom up, especially when the PDO is warm, and most especially when the water is warmest in August. Currently the NRL ice-movement map shows that the ice is being pushed north. 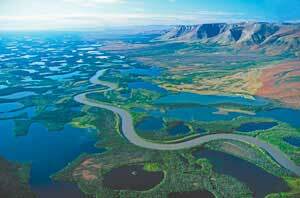 At this time of year the Mackenzie is in full flood, due to vast amounts of snow melting, and all that water is pouring out into the Arctic Ocean. Even when it is ice water it spreads out over the denser salt water, and when it warms only to 33° (+0.6° Celsius) it can be warmer than the salt water, which can be down around 29° (-1.7° Celsius) in the spring, and this gives the river-water another reason to spread out over the salt water, because warm water is less dense than cold water. This flood of milder, fresh water at the surface contributes to the break-up of the ice in that area. 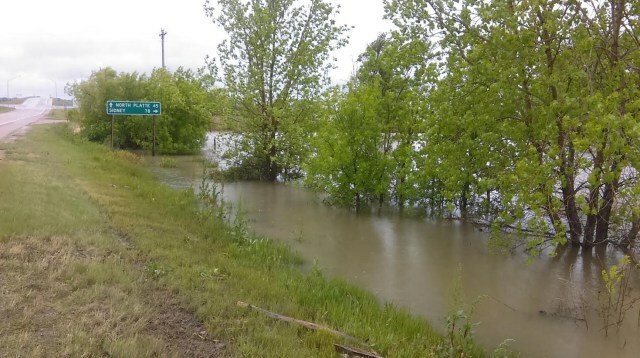 Until it can be shown that the river is consistently thawing and flooding earlier each year, (it was late a couple years ago), then the melt around the Mackenzie Delta has nothing to do with Global Warming. 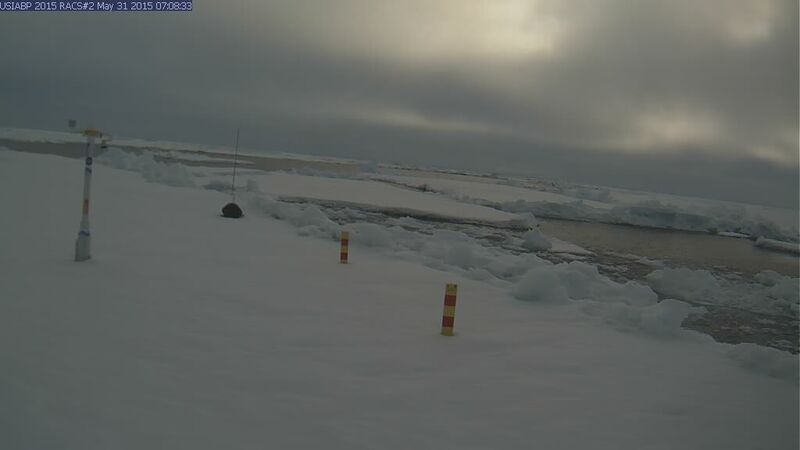 Therefore one is able to conclude that, while open water is appearing along the shores, the ice towards the Central Arctic is still being built up thicker. 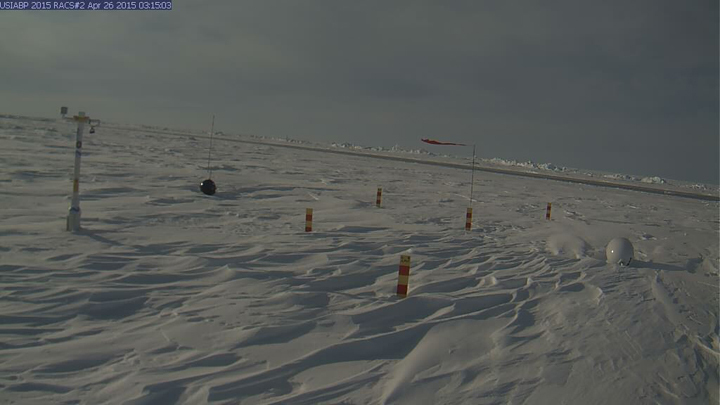 They were showing south winds and a thaw, but all but one have recently slipped back below freezing, with Buoy 2015D: the coldest at -3.77° C (25.2° Fahrenheit) and the sole exception to below freezing temperatures being Buoy 2014I: at +1.59 C (34.9 Fahrenheit). 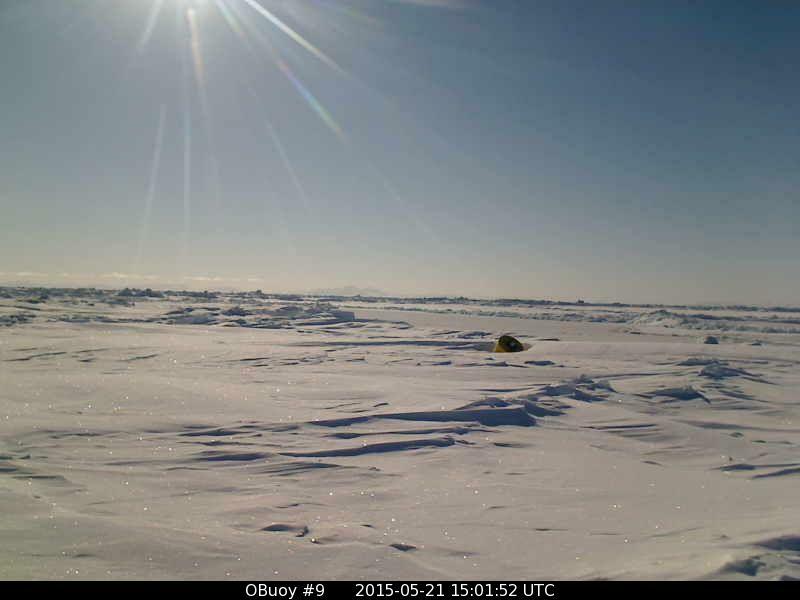 My old friend is Buoy 2012G: which was placed up near the Pole back on October 1, 2012, and taken its sweet time riding the ice south and then west. 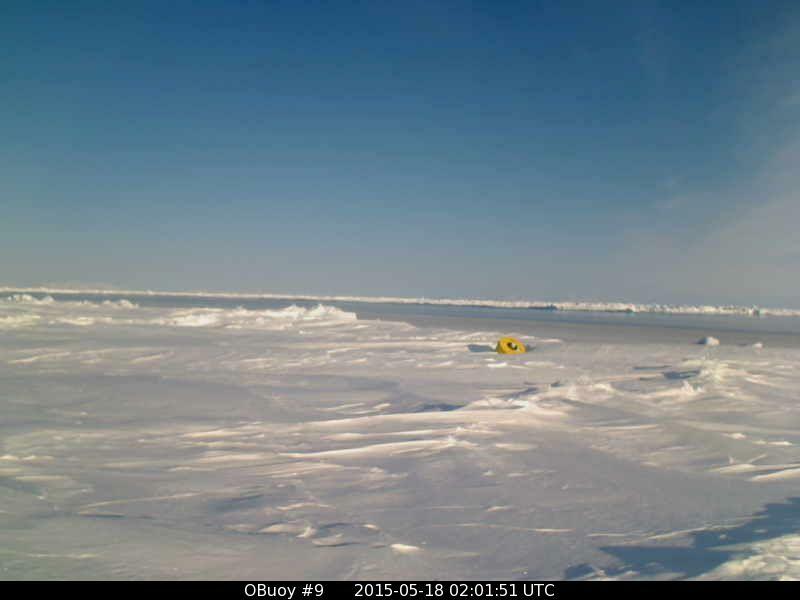 Most interesting is the new Buoy 2015B: which was placed last March 26, and has shown the ice drift west and then get crunched north. I noted a certain Alarmist making a big deal about the open water in the second picture, exclaiming it was early for the ice to be “melting”, and pointing out the NTL Lead Opening Rate map didn’t show this “melting” (from a satellite stationed miles above). Comments and conclusions such as his are why it is important to use your own lying eyes, and watch things for yourself. It enables you to politely respond with facts. For example. 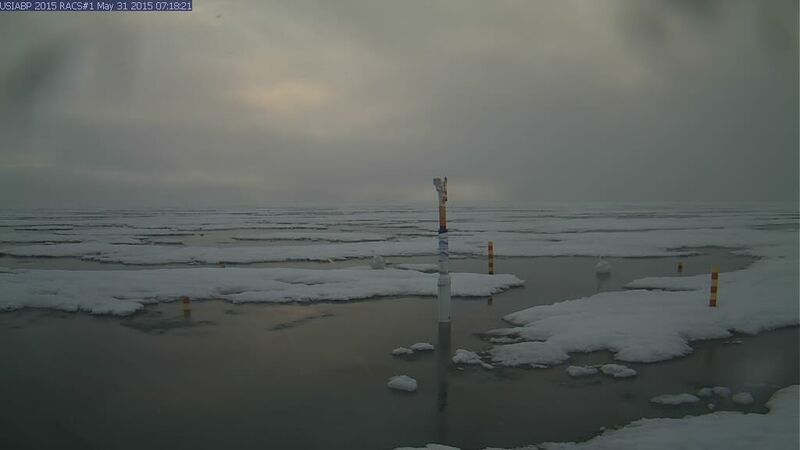 I could point out that the temperature is currently -0.66° C at Buoy 2015B, so no melting is occurring, and suggest that what is happening is that the ice is getting crunched as it is blown north, and in fact there is more compressing going on than lead-opening or “melting”. 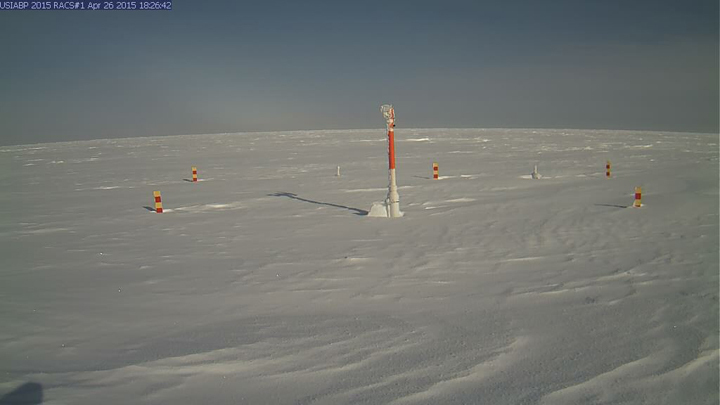 The only sign of the recent thaw is that the snow has shrunk down enough to expose the very top of the buoy. A week or so ago you could only see the antennae sticking up. The Beaufort Breakup is only just beginning. Here’s to a summer of happy watching! The most interesting buoy continues to be O-buoy 9, which had a wide lead of open water appear before its lens during a period of strong winds from the west. This lead swiftly was freezing over. This process has continued, and the lead appears to be crunching closed. With luck we could watch how open water is transformed into the mini-mountain-range of a pressure ridge. The reason for the refreezing is that temperatures have steadily remained below -12° C, despite the fact the sun barely sets up there, just off the north coast of Greenland. (To the right, on the horizon of the upper picture, and to the center, on the horizon of the lower picture, is a persistent object whose persistence proves it isn’t a cloud. It may be a mountain on Greenland, or only a massive iceberg.) The camera is drifting slowly east. 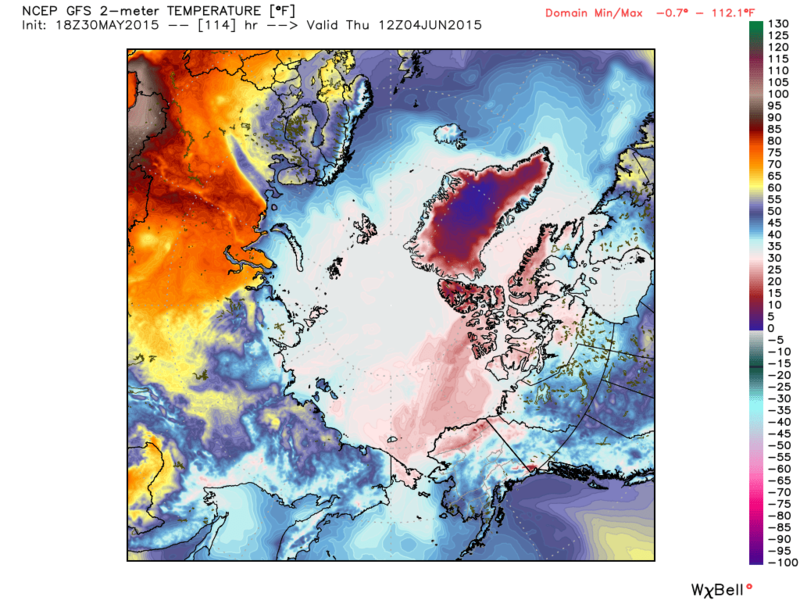 Most of the cold temperatures have shifted over to the Greenland side of the Pole. It is high time for the Pole to be warmed, for it was actually milder up there more than a month ago. 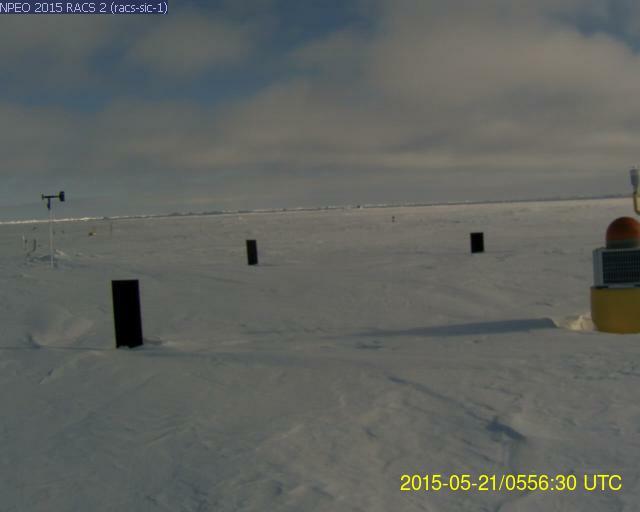 Ordinarily it is rapidly warming at the Pole in May. 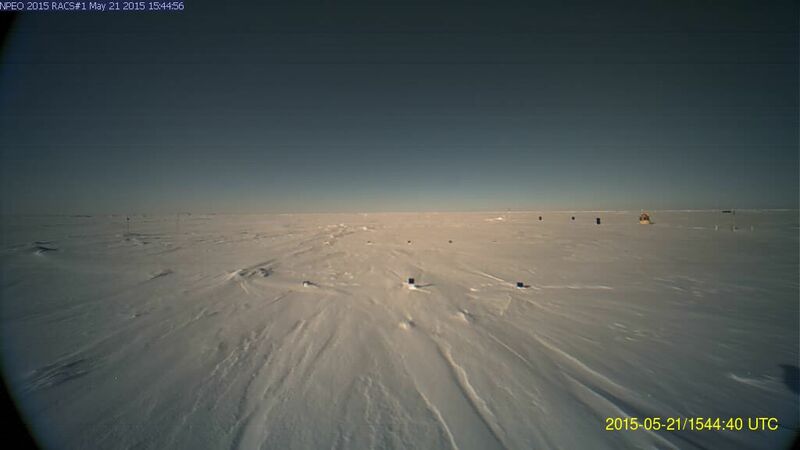 However six hours later the situation was bright and clear, as viewed from camera 1. 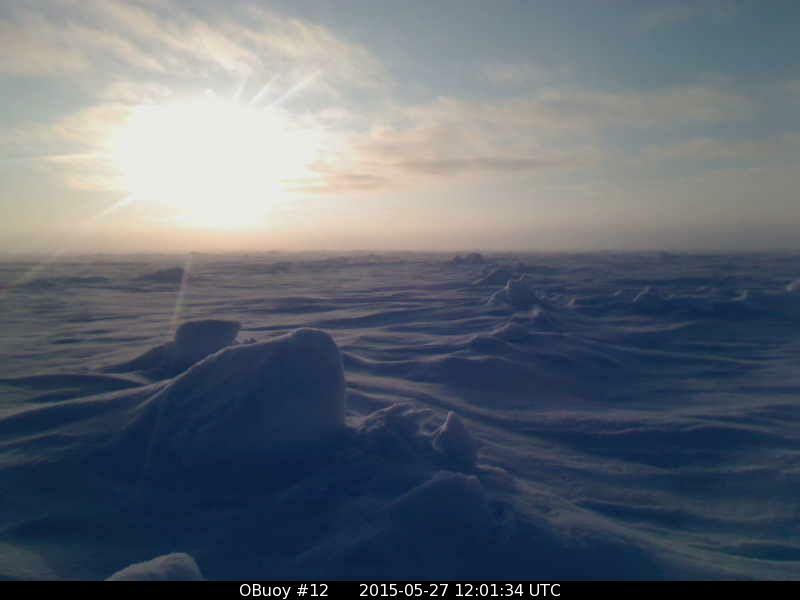 The cameras are slowly drifting south, and it looks like things will be less exciting than last year, when the ice moved more swiftly and began breaking up. 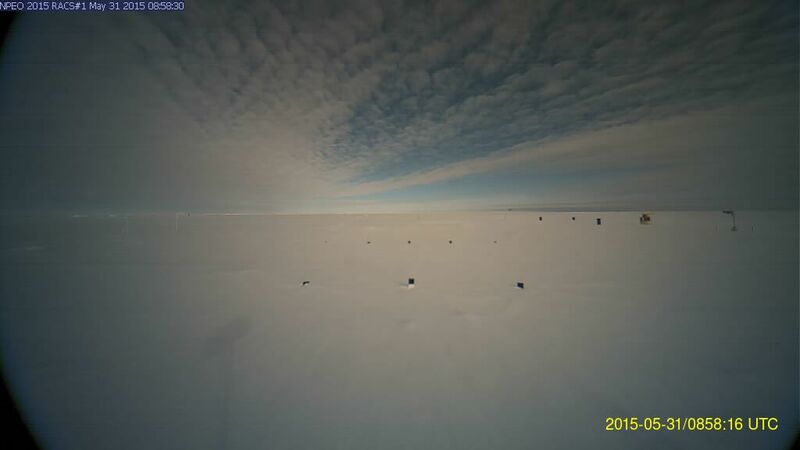 As of 2100z on the 19th the cameras were at 88.186°N 13.934°W. which is further west than usual. I doubt it will happen again, but the fact I’m again sitting here waiting for the ice to melt may indicate I have a secret hope that every dog has two days.